Faster than a speeding bullet? You've got it covered. Of course, you do! And that's because you're not even from Planet Earth, originally. But you love our yellow sun! Yes, you're from Krypton, and the fact that you're here on Earth with our bright yellow sun has yielded some interesting side effects. Namely, speed, strength, and the ability to fly! Well, x-ray vision, heat vision, enhanced hearing, and a whole bunch of other abilities, too. Which means it's time to put them to use. You should be a hero! You really should consider it, at least. How about we give it a spin? Just start with a superhero costume, and see how it goes. As it happens, we have just the thing for you! That's right, this Adult Superman Plus Size Costume will have you ready to save the day. As a stylish superhero with an "S" on your chest, you'll be Superman! Put those super abilities to good use, look great, and earn the adoration of fans worldwide. It's all in store for you when you choose this costume! 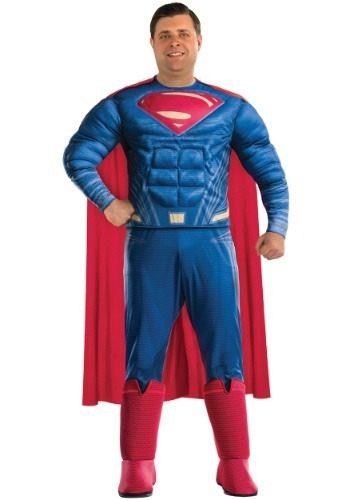 For plus size men, this Superman Costume is DC Comics officially licensed. With classic styling and details, it comes with a blue shirt top, pants with attached boot covers, and a cape. Everything you'll need to save the day! 100 percent polyester, the shirt features enhanced muscle effects with fiberfill stuffing. It also features the "S" shield on the chest, and the shirt and pants feature graphic printed details. The cape secures to the costume top with hook and loop fastener strips on the shoulders, so you can wear it or remove it as needed. So, we'll clue you in, you don't actually need to be Superman or even hail from Krypton to choose this Superman costume. Pick it out for your Halloween party, and we're sure you'll pass for the real deal! You'd be hard-pressed to find a more fun costume choice than this one, so go on, get it and before you know it you'll be saying "Up, up, and away!"